There are a lot of things you notice when you move: subtle differences in culture, changes in the way you go about your life, and the overall attitude of people in your new area. It’s the little things that tend to gnaw at you the most, or at least to me.I recently moved to the San Francisco Bay Area (though city snobs are very clear that I’m not to say I’m in San Francisco, even to people far away from the area who make no differentiation between SF and twenty miles in any direction therefrom). Traffic rules are different. Way different. This is partly because traffic is a pretty big deal here. However, having lived in DC (in the same way that I now live in SF), the Bay Area does things much better. Traffic moves on 101, even during rush hour. I can’t say the same about the Capital Beltway, with which I am painfully familiar. I met two of those bad boys going from Cupertino to my office in Menlo Park. Now the good: Metered highway entrances. This idea is so good and so effective that I can’t believe major metropolises around the country aren’t required to do this by law. I’ve never seen it anywhere else, but the only other major cities in which I’ve driven are Philadelphia, Baltimore, DC, and Seattle. So, lots of them. The concept is simple. At most (but sadly not all) entrances to the major highway, which in the Peninsula (Silicon Valley) is US 101, there’s a stoplight. The stoplight periodically flashes green, then goes back to red, allowing exactly one car onto the highway. The genius of this is obvious the first time you pass one of these entrances while you’re on the highway—no gigantic pile-ups at every damn entrance. It’s even more obvious when you get to the occasional on-ramp that doesn’t have a meter, and you see a huge traffic jam. Now, there are still lines of cars behind that stoplight, but the pile-ups are pushed back onto the feeder roads, where they belong (and where they are way less frustrating). It’s okay to have stop-and-go traffic on a little road. It’s enraging to have it on the freeway. Even going north on 101 at 5:30, which I’ve had the misfortune to do a few times now, the traffic in the Bay Area isn’t nearly as bad as traffic on the Capital Beltway. Cars move, even if only at a crawl. Outside of traffic, you also have other little things that stand out. For instance, the obsession with sorted trash is almost hilariously omnipresent. I don’t mean sorted recycling—that went out of style years ago all over the country. 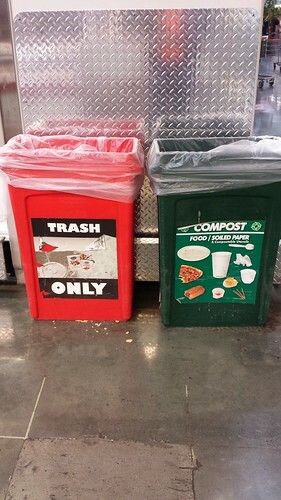 I mean the ever-present tripartite trash consortium of landfill, recycling, and compost. Everyone, everywhere, does compost. Even in Costco. There’s also the elephant in the room. Housing. Housing is absolutely stupidly expensive in the Bay Area, even if you keep out of San Francisco itself (which I did). I went from a 2100 square foot house in downtown Raleigh to a 754 square foot apartment, and I’m paying more on the apartment than I was on my mortgage. Most of the places, particularly in the northern parts of “The Peninsula” are pretty old. You can blame this on a lot of things, but most of it has to do with the Bay Area’s general aversion to building over things (because they’ll “lose character”) and the lack of incentive for anybody to replace things. Why build a modern apartment building when you can charge people through the nose for the one you already have? Why sell your house for denser stuff to be built on top of it when the rent you’re getting from tenants is double the mortgage you took out on it fifteen years ago? Central heating and air are foreign here. 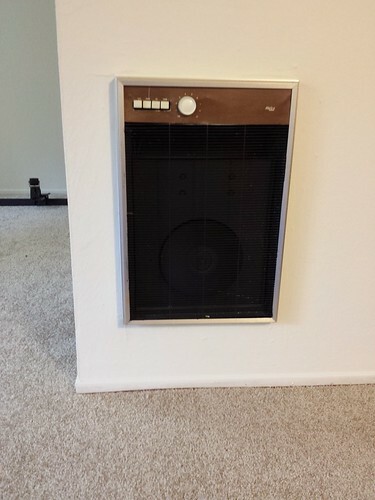 For instance, my apartment (that is relatively nice, but not top-of-the-line) has a heating unit that looks like this. I say heating, because there is no AC. In theory, we’re almost never going to need AC, and to be fair, we don’t really need a more robust heating system, as the two of those little units work just fine for the incredibly mild “winter” we’re experiencing. It all adds up to a very weird feeling. I’ve never made more money in my life than I am right now, but I’ve also never lived in a place this small since I was a graduate student. Actually, my grad student apartment in Philadelphia was bigger than the one I currently live in, even considering square feet per resident, but the landlords at my current place are nicer than the people who ran the mostly-students building I lived in back in ’05. There are other things: food is spicier, though it isn’t labeled as such. Sriracha is everywhere, on everything. Pretty much all craft beer is IPA, which is really starting to piss me off. Don’t get me wrong—IPAs are great, California, but branch out every now and then, okay? Stouts, sours, porters, ambers, wheats, Belgians… anything. Come on! There have been good parts and bad parts about moving. Mostly, I’m just glad to be living in a place I can sort of call home again after two months of living out of suitcases. We’ll see how the California experiment turns out. The thing about moving all the time is that you never really get to hold onto a sports team. I grew up without a team, in Raleigh. People used to say that the Braves were our team, which always annoyed me because I disliked Atlanta as a city for no particular reason. I’d never been. Still never have, other than an airline stop or two. The Hornets were in Charlotte when I was young, but I never really got into the NBA. Also, ask a Raleigh person how much they know about or care about Charlotte, and you’ll see how much I was attached to them. It’s a three hour trip between the cities, and neither cares much about the other. The Panthers came to Charlotte while I was in high school, and for a while I really got behind them despite their Charlotte location. It beat pretending to care about the Redskins. Then I went to college at NC State, right in downtown Raleigh, and lo and behold I had a team that I really stuck with for a while, as it had a tendency to follow me, unlike the cities I lived in. I suspect that’s why there’s so much enthusiasm for college sports. You can move all over the country or all around the world, and you still always graduated from that same college. Of course, after I graduated, I graduated again, mostly from a different college. And in the five years I spent graduating with various degrees from Penn, I did a few things, sports-wise. First, that was right at the start of the Eagles’ four consecutive trips to the NFC championship, so it was really easy to get behind the Birds. That was fun. Second, I was never able to see any NC State games. The only college sports games on TV in Philadelphia were the Big 10 game of the week (our nation’s dumbest conference, having twelve teams as it does), whomever Notre Dame was playing, and the Penn State game. I gave exactly zero craps about any of those, which didn’t lead me away from NC State so much as it made me not care about college sports. I didn’t know the players’ names anymore, and there was a new coach for this sport or that every other year. It was hard to keep up, and harder to care. I moved to Seattle after that, right in the midst of when the Supersonics were being moved to Oklahoma City. Seattle is a great city. I wouldn’t mind going back there. I went to a bunch of Mariners games, and one Seahawks game. It was the first time I’d ever watched an NFL match live, and it was awesome. The Seahawks got into my blood a little bit then, and even now they’re sort of my team, at least as much as anyone is. I held onto the Carolina Hurricanes a little bit throughout my moves, largely because it was easy not to pay attention to local hockey. It was fun to watch them win the Stanley Cup, which I did from just east of Oakland. I spent some time in DC, where I found out that it was easy not to care about the Capitol area’s teams. Everybody there hates them. They do their best to be hate-able, particularly the Redskins. Dan Snyder, the owner, is a cartoonish villain to his fans, and he deserves every bit of scorn they have for him. I went back to Raleigh, went to a few ‘Canes games, a few NC State games, and found that although I could rout for them, I wasn’t really invested in it. The NCAA tournament adds a little bit of oomph to it, but most of the time it’s just a game, with just some teams. I know to cheer for the ones in red. We lived for a while in Raleigh, my wife and I. We had always said that we wouldn’t bother buying a house until we felt like we weren’t ever going to move again. When we spent two years at the same address (a first! ), we decided it was time to buy a house. We lived there for a year, and then I got a job offer from the Bay Area. I took it. Now I’m at my grandparents-in-law’s house in Cupertino, watching the Panthers and 49ers in the playoffs. I don’t know whom to rout for. I like the games. Fantasy football has a way of making them all interesting, even after the fantasy season is over. I know the players on both teams, who’s been hot, who’s been hurt. I see a fantastic performance and wish that guy was on my team, thinking of how many points I would have scored. I won my league this year. That was fun. Marshawn Lynch and Jimmy Graham won me my title. Nick Foles was a nice pickup when Matt Ryan fizzled out mid-season. I see the black-and-teal on TV now, matching up against the red-and-gold, and wonder. I’ve been a nomad for most of my life now. Philadelphia, Seattle, DC, Raleigh, and now San Francisco. It helps that I have no children. No idea how that would complicate things. Kids are something I’d like to have, I guess, but I have no idea how I’d manage it. It seems like the fun part of children happens long, long after the investment. Nothing about infants and toddlers looks like they’re worth it. Don’t get me wrong; they’re adorable. I’m also well aware that the adorableness comes in short bursts, followed by long, long periods of you acting as their slave while they hate you for it. Parents say it’s all worth it, of course. Usually. I wonder if not having a team to call my own is sort of like not having a home. Raleigh still feels kind of like home. It’s where I was raised, after all. It’s also where the house I own still stands. The house is turning into a money pit, as houses are wont to do. People say a house is a good investment. I wonder about that. I doubt if it’s true anymore. Buying a house in the Bay Area thirty years ago would have been a great investment. Now, I doubt it. It’s probably a good investment in the same way that having kids makes you happy, in the sense that everyone says it does, but when the experts review matters, it really doesn’t. So we’re trying, my wife and I, and I suppose my dog as well, to figure out the best thing for us. Careers, life, happiness and all. To be fair, my dog isn’t as uncertain as my wife and I. He figured out the best thing a long time ago. We should all be staying with my parents in Raleigh, as we did briefly when moving from Seattle to Raleigh, before our apartment was ready. And he’d much rather my wife and I work from home. It’s all very simple from Chewie’s point of view. It would be nice, sometimes, to have that kind of clarity of vision. If we took his advice, I’d see NC State and the Carolina Panthers on TV all the time. Maybe I’d remember the players’ names, or at least the coaches. We wouldn’t be paying for repairs on a house we don’t live in. And since I’m married I wouldn’t have to care about the dating penalty for living with your parents. I’d have teams that were mine, and a home (if not a house). Chewie would be happy, as would my parents dog, who loves him with a passion you wouldn’t think you could find between two dogs (one male, one female) that have both been fixed. Maggie (my parents’ dog) is not going to be happy tomorrow morning when Chewie gets in the car with my wife and sister-in-law to come to California. There’s a good chance the two dogs will never see each other again, being close to seven and six years old, each. We’ve cruelly ignored the dogs’ wishes, though, and are going to be Californians for some time now. I have no idea for how long. We’ll have good weather, and the 49ers will be on TV. We’ll have the Giants, and to the extent I care, the Warriors. We’ll have beautiful weather all year long. We’ll have good jobs. Or I will. My wife hasn’t started hers yet, so I suppose the jury’s out for a few weeks. But we’ll live on the Peninsula, have a decently walkable neighborhood with a shoebox for an apartment (but a shoebox with washer and drier! ), and have a whole new culture to absorb. It’ll be an adventure. Each of the places was its own little adventure, and I hope this one is a good one. So many adventures. So many places.